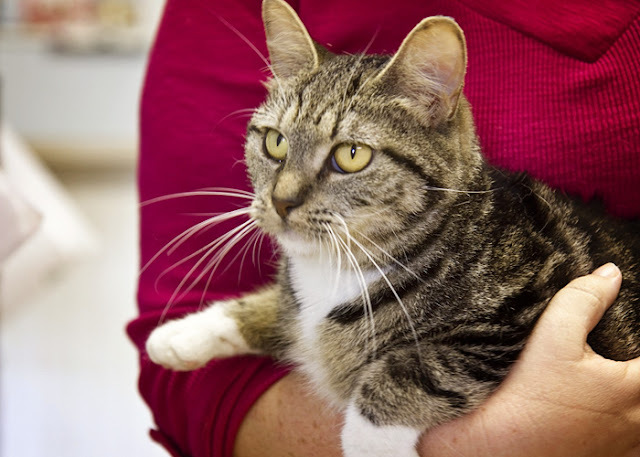 Here are three more cats who are available for adoption from the Humane Society of Noble County. They are all relatively new to the shelter, and they are all up-to-date on shots, worming, and flea prevention. The first cat is Meeka, a black, silver, and tan tabby. She is approximately 3-4 years old, is front declawed, and is thought to have been spayed. 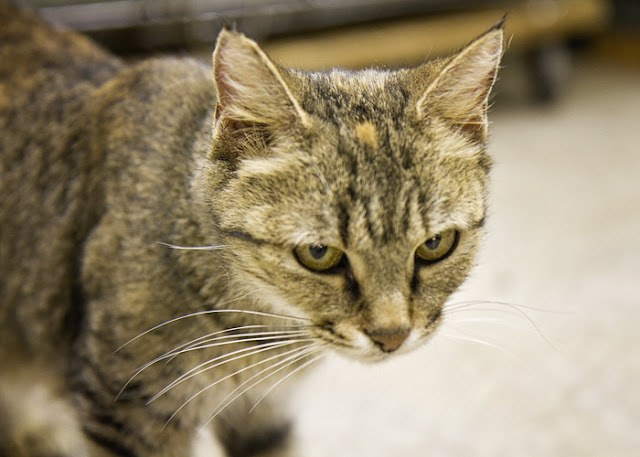 She has only been at the shelter for a few days and is a little scared, but you can tell that when she gets used to her surroundings, she is going to be a friendly, loving cat. The next cat is Monarch, a buff and white long-haired male who is 4-5 months old. He has been at the shelter for a couple of weeks. 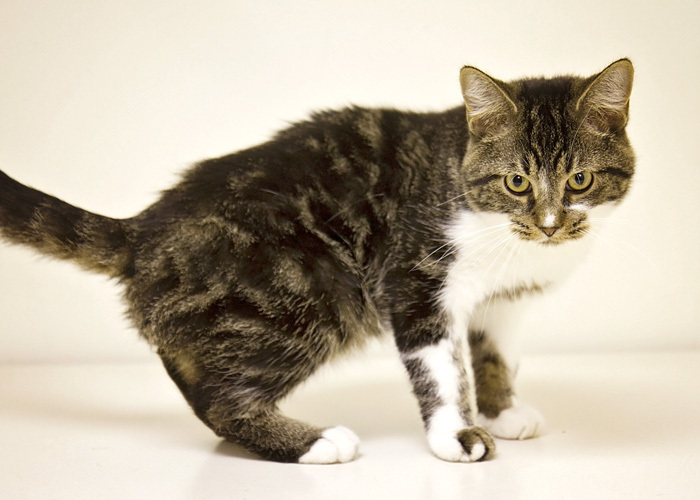 Monarch is very curious and playful, but also very affectionate. He loves to be held and cuddled! The third cat is Manolo, a black, tan, and cream male tabby with medium-length hair. He is 3-4 years old and has been at the shelter for only a few days. He is very friendly and loves attention! For just a few more days, these cats or any others can be adopted for only $15, less than half the regular price. Come see them today! 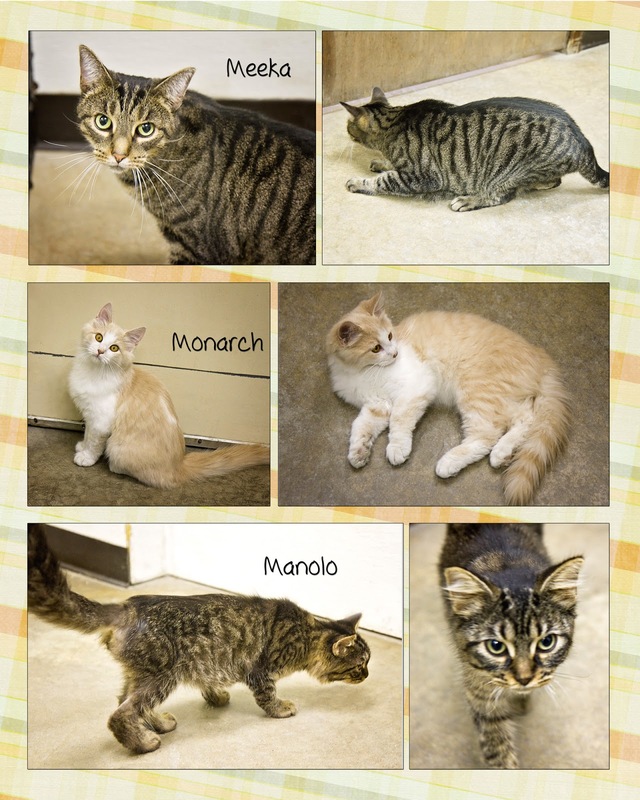 Here are four more cats that are available for adoption at the Humane Society of Noble County. They are all up-to-date on shots, worming, and flea prevention. 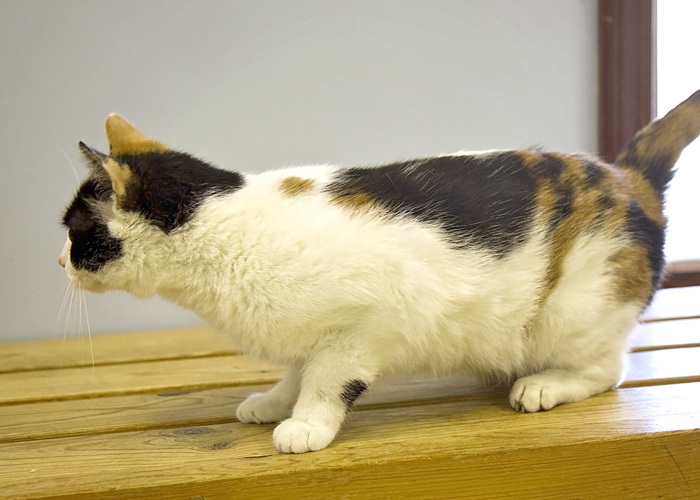 Bandit is a medium-haired white cat with black markings. He is approximately 4 years old and has been at the shelter for only a few days. 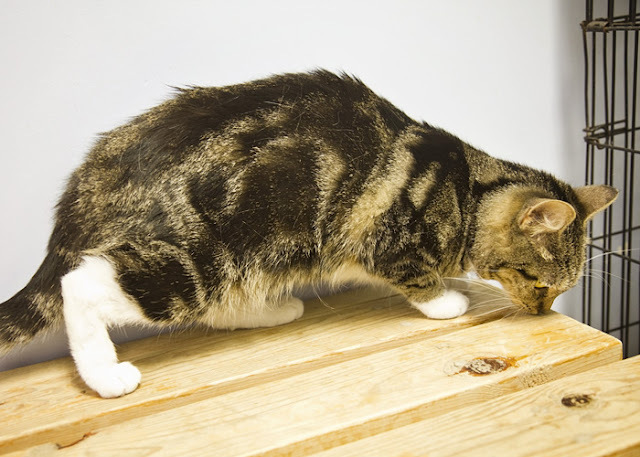 He is very friendly to people and other cats - see him kissing a cat in another cattery! 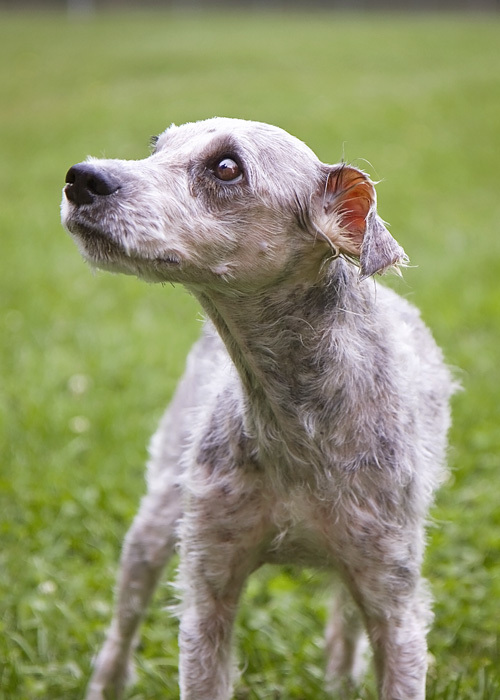 Gino is a gray male with white on his face, chest, and paws. He is 2-3 years old and has been at the shelter for about a month. He is curious and friendly. 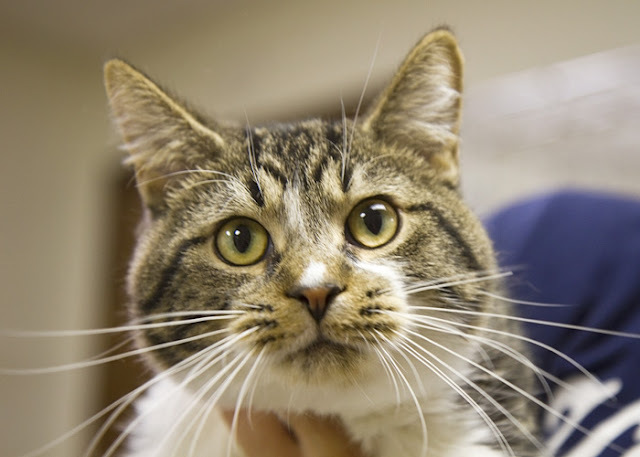 Huck is a black and tan male tabby who is 2-3 years old.He has been at the shelter for a couple of weeks. He loves and craves attention, and needs someone who will fatten him up a little. 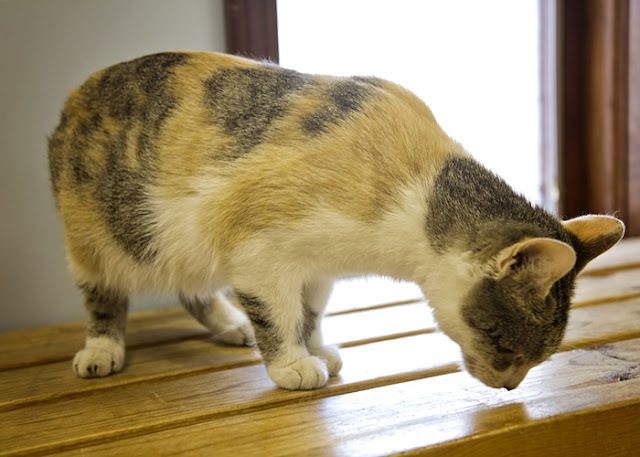 These cats and MANY other animals are waiting for you to come visit them at the Humane Society of Noble County and give them their forever homes. Remember that during the rest of October, cats can be adopted for only $15, less than half of the regular price!! 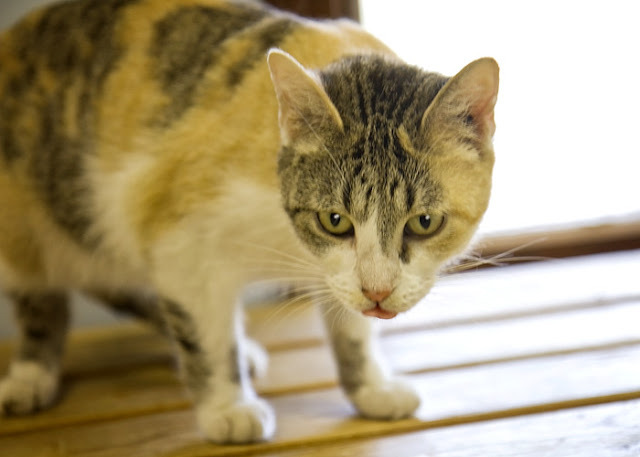 Here are three of the calico cats that were featured in the Halloween Cat picture. 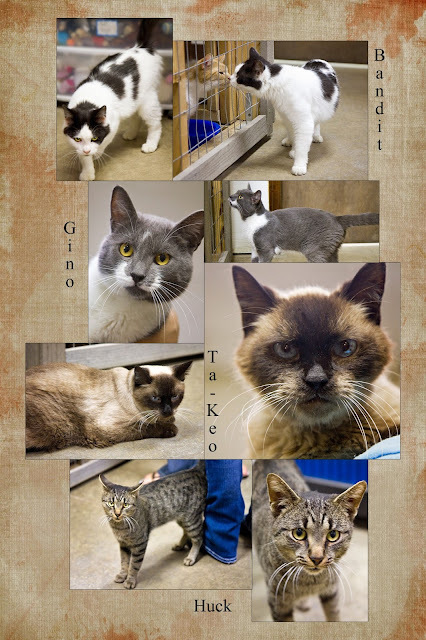 They are all available for adoption from the Humane Society of Noble County. They are all up-to-date on shots, flea prevention, and worming, and are FIV-negative. Scroll through the pictures to find out more about each individual cat. 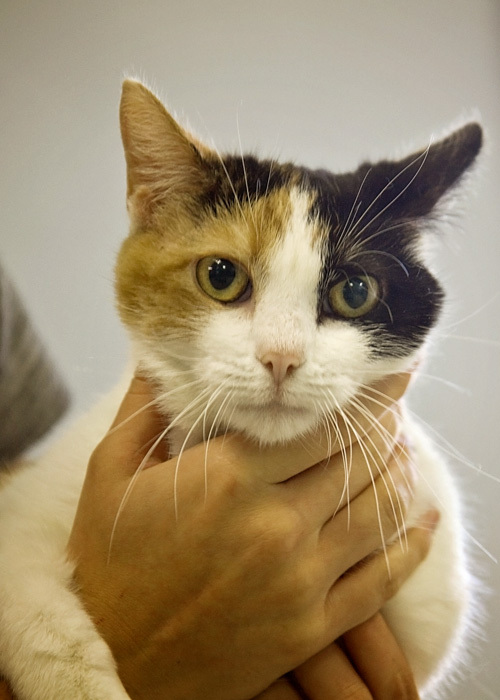 This calico beauty is Gidget. 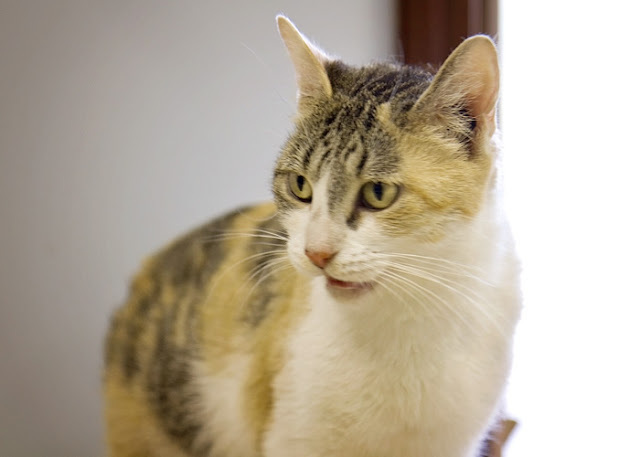 She is approximately 1-3 years old and has been at the shelter since February, 2015. 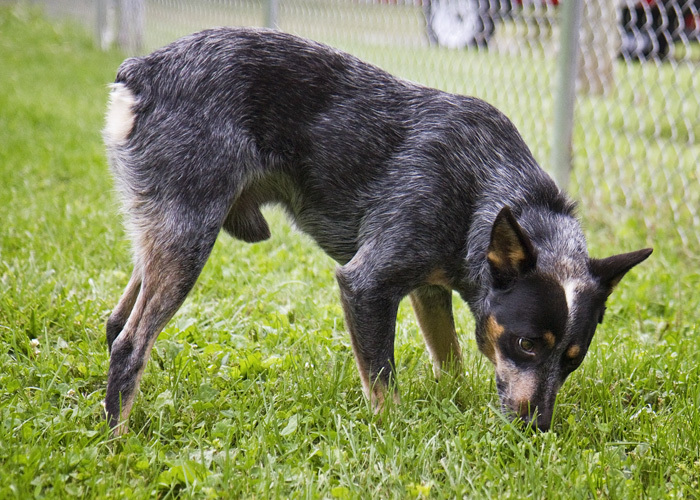 This picture gives you a better idea of Gidget's coloring and markings. 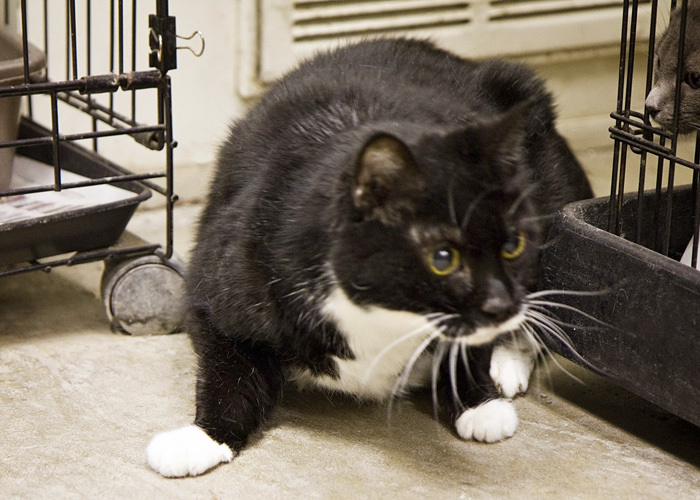 Gidget is a curious cat, likes to explore, and is very friendly. She would love to go home with you! 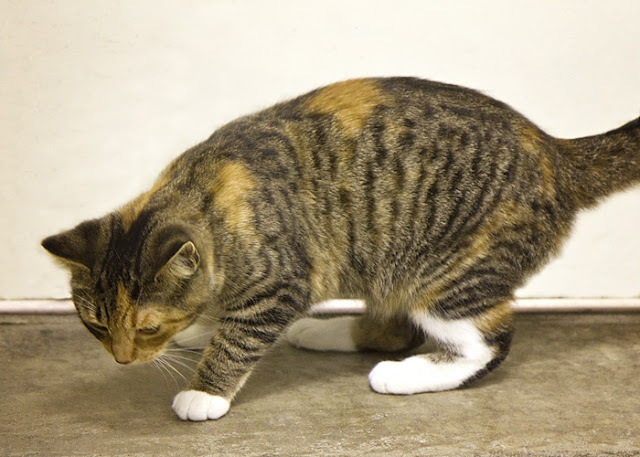 This is Marina, a calico with tabby markings. She is 1-2 years old and has been at the shelter for 2 or 3 weeks. This picture shows the white on her neck and chest. Marina is curious and friendly. She loves attention and has a very loud motor! Could you give her a forever home? This is Tootsie, who is 3-4 years old. 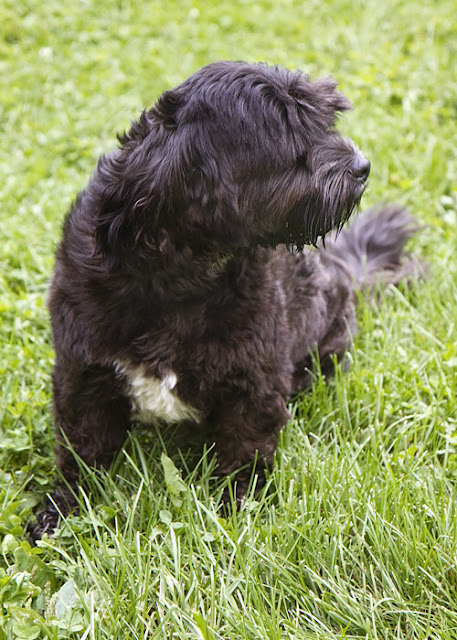 She is black and orange with a white neck and chest and white on her paws. She has been at the shelter since March, 2015. Tootsie has some tabby markings, including the M on her forehead. Tootsie is a very cuddly girl, and she would love for you to give her a home where she could cuddle with someone every day! 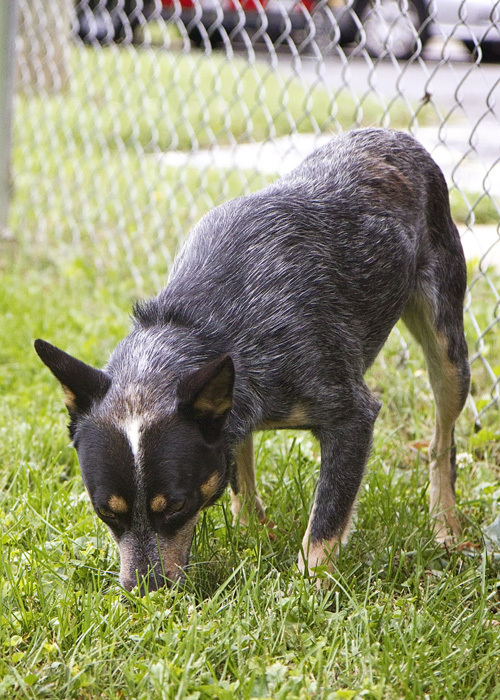 Please visit all of the cats and dogs at the Humane Society of Noble County! For the rest of October, all cats and kittens can be adopted for only $15, which is less than half of the regular adoption fee. These animals just want a safe home and a lot of love, and they will love you unconditionally in return! 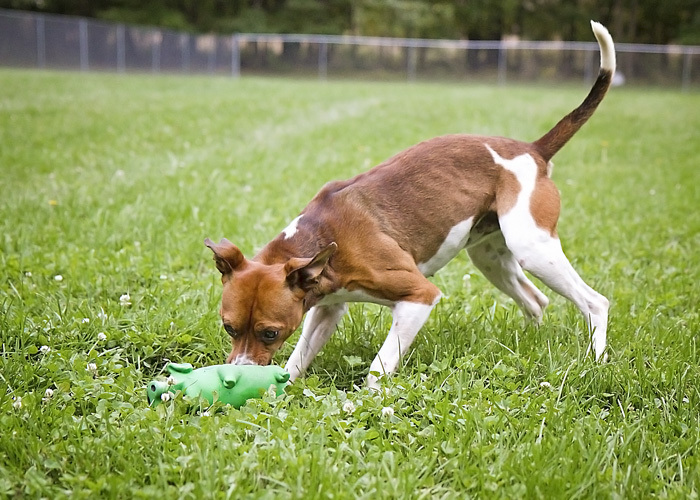 Today I will feature a few of the many wonderful dogs that are available for adoption at the Humane Society of Noble County. This is Ashton. His fur was so dirty and matted that he had to be shaved. 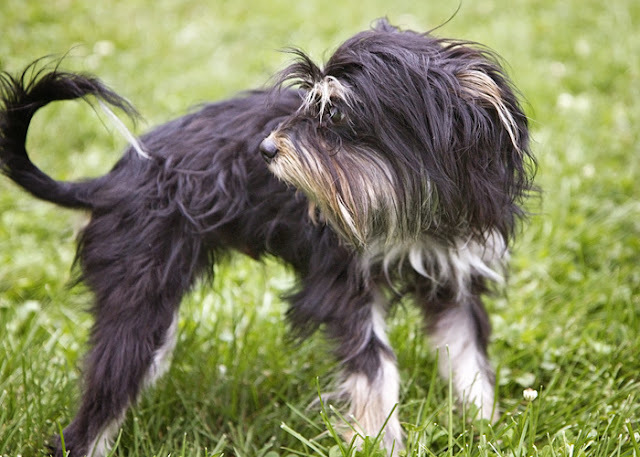 This shows what he looked like before the haircut and what he looks like now as he waits for his hair to grow back. 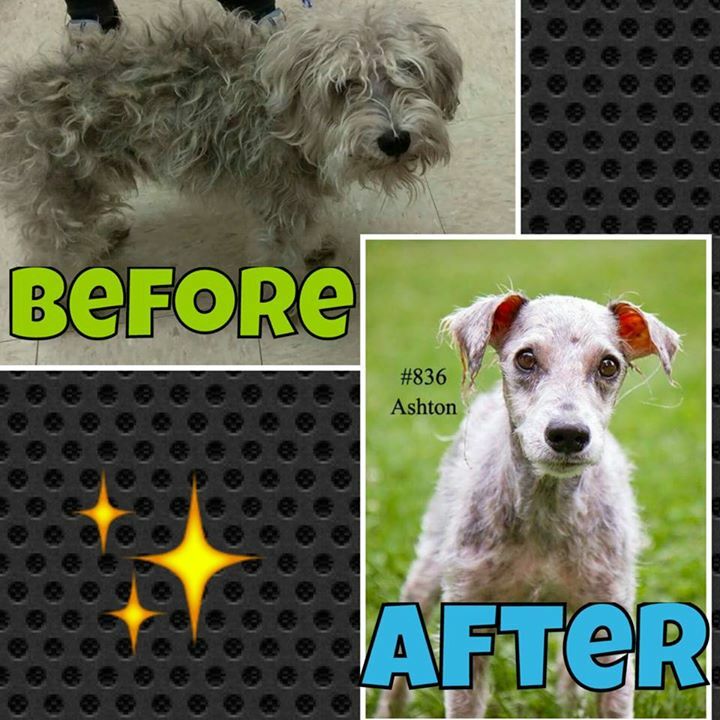 Ashton is a senior dog. He is up-to-date on shots, worming, flea prevention, and bordetella vaccine. He is also neutered. Ashton is a very friendly and lovable guy. Just look at those eyes! He has been at the shelter for a couple of weeks. Could you give him a new home? This is Barkley, a Mountain Feist dog who is approximately 5 years old. As you can see from this picture, Barkley is full of energy and needs a place where he can run or be taken for a walk every day. Barkley has had his shots, worming, and bordetella vaccine and is heart worm-negative. Here Barkley is playing with a rubber pig that oinked. Barkley loved it and went crazy tossing it in the air and chasing it! Here he is chasing it again. 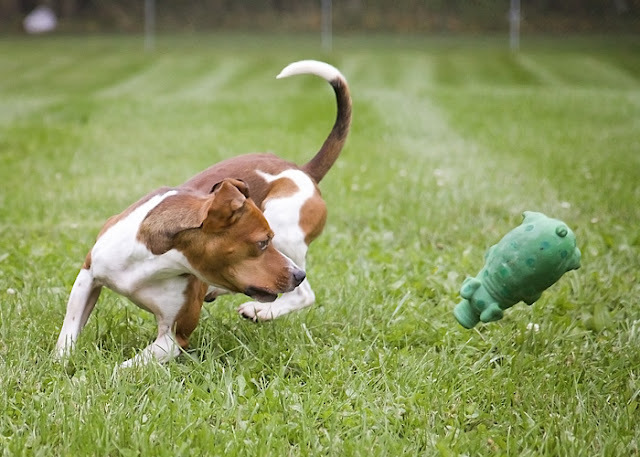 Barkley has been at the shelter for about a month, and would love to go home with you! 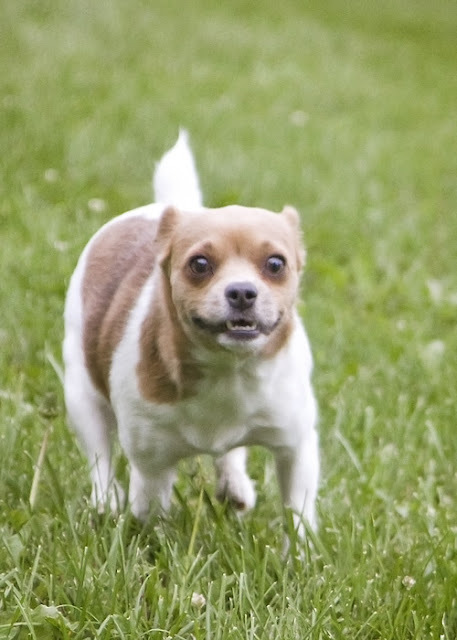 This sweet little girl is Cookie, a chihuahua mix. She is approximately 3-4 years old. 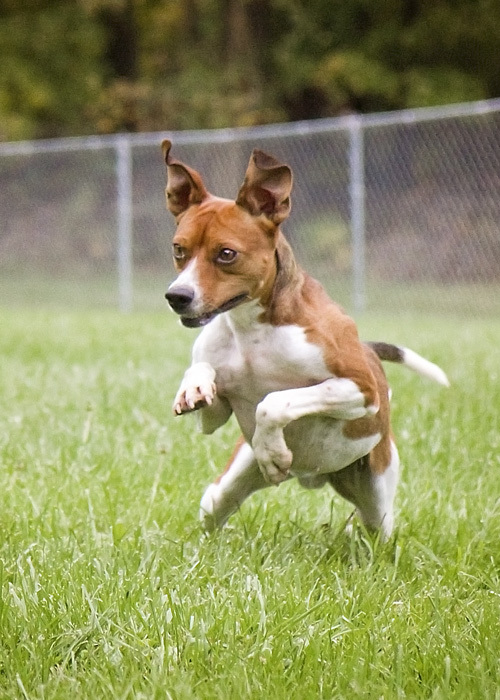 Cookie is very friendly and loves to run and play. Cookie has had her shots, flea prevention, bordetella vaccine, and she has been wormed. You can get a good idea of her size from this picture. Cookie has been at the shelter for only about a week and is waiting to go to a loving home! 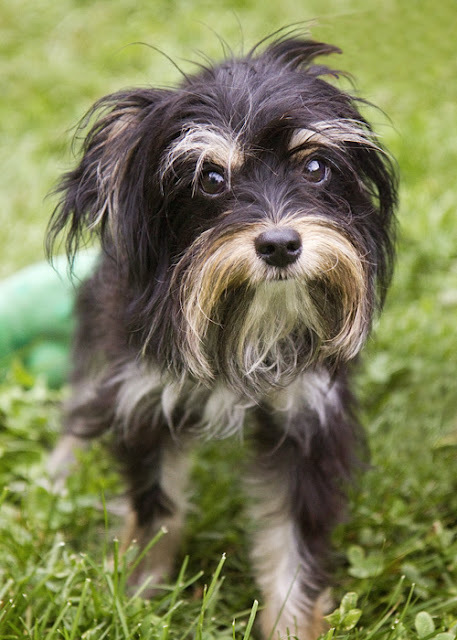 There is an application pending on Cookie, but if it falls through, she could be yours! 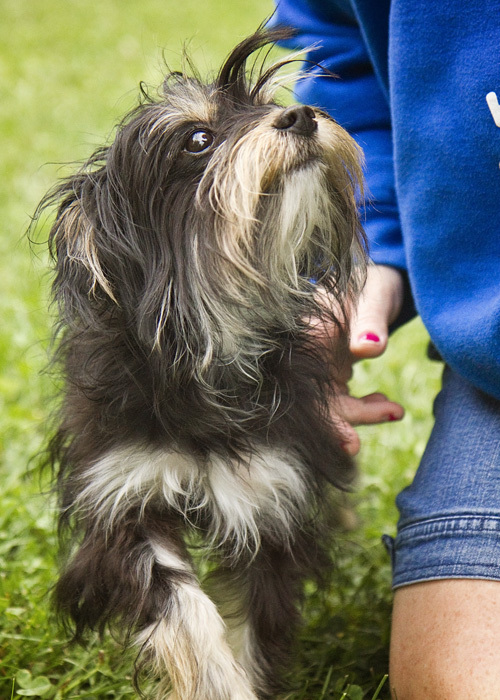 This is Flynn, a Yorkie mix who is 2-3 years old. Flynn has had his shots, worming, and bordetella vaccine. He is a very loving guy and this picture gives you an idea of his size. Flynn has been at the shelter for a little over a week. There is an application pending on Flynn, but if it doesn't work out, he would love to go home with you! 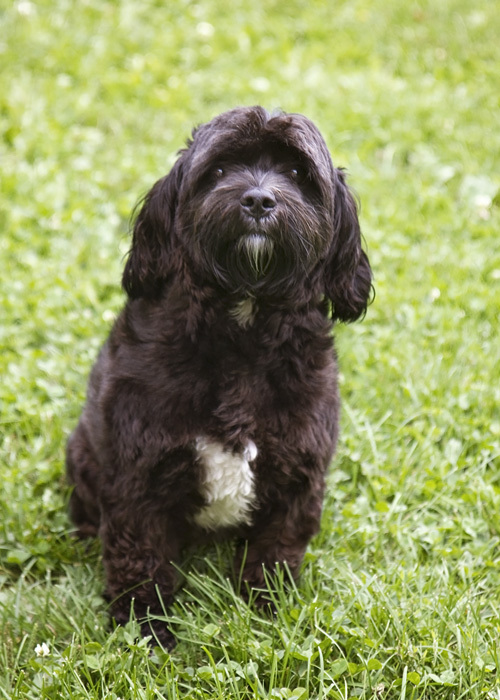 This little cutie is Gabe, a black Schnoodle. He is approximately 3 years old and has been at the shelter for a couple of weeks. Gabe is up-to-date on shots, worming, flea prevention, and bordetella vaccine. He is also microchipped. Come visit this little lover and see if you could give him his forever home. 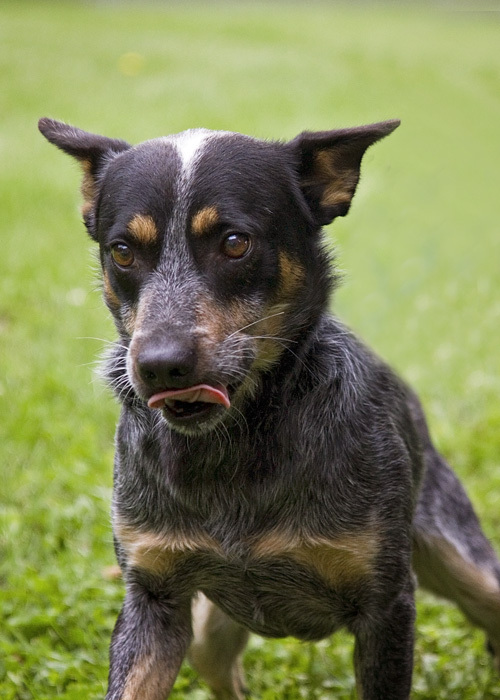 This is Tango a Blue Heeler, also known as an Australian Cattle Dog. He is approximately 4-5 years old. 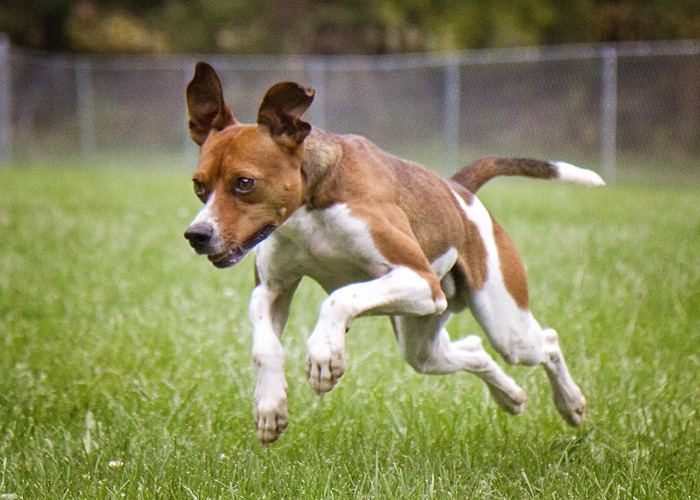 Tango is up-to-date on shots, flea prevention, bordetella vaccine, and worming. Tango is curious and friendly, but right now he is very shy. He has been at the shelter for about 3 weeks. 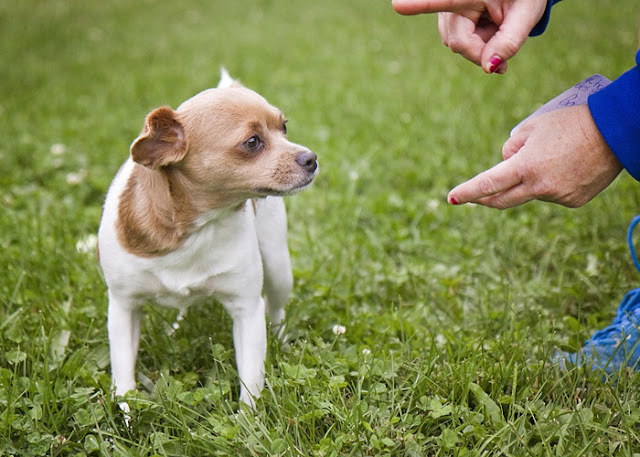 He will make a wonderful pet once he feels comfortable and secure in his surroundings. Come visit this gorgeous guy! Please come to the Humane Society of Noble County to see these dogs and all of the other fantastic cats and dogs who are available for adoption. Dogs can be adopted for only $50, and during the month of October, cats can be adopted for only $15 rather than the regular $35. Here are some fairly recent additions to the list of adoptable cats at the Humane Society of Noble County. Through the month of October, any cat can be adopted for only $15 because of the over-crowded situation at the shelter. 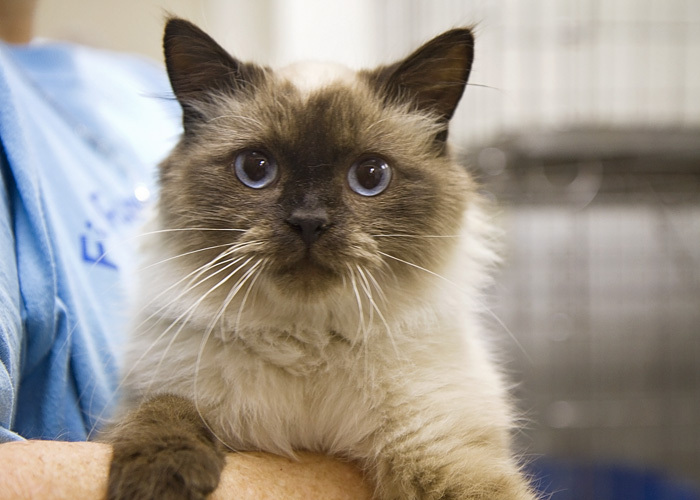 This is Chen, a brown and cream chocolate-point Siamese with medium-long hair. 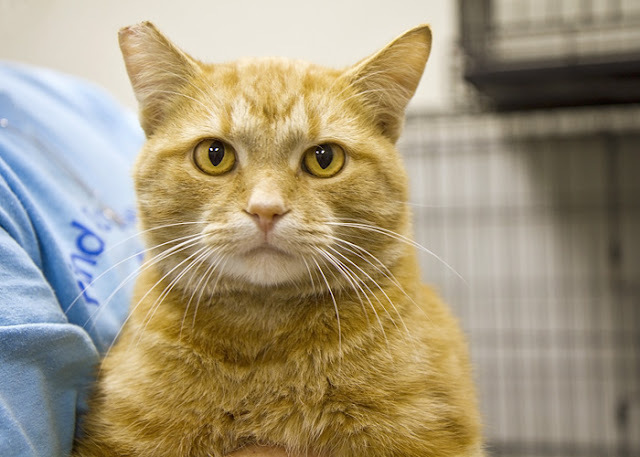 Chen is between 3 and 6 years old, and has been at the shelter for about 3 weeks. 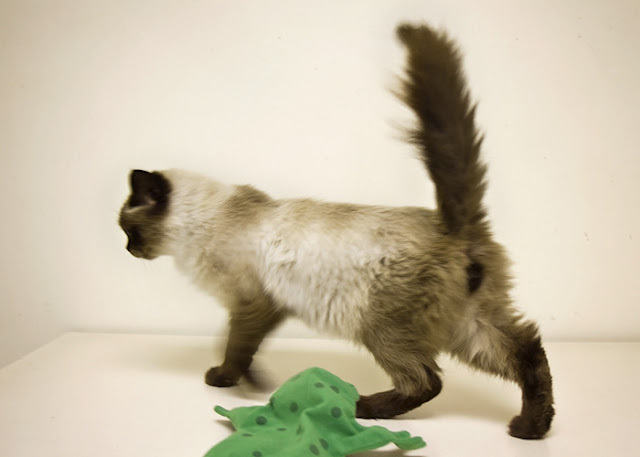 This picture is a little blurry because Chen was on the move - exploring! Look at Chen's beautiful blue eyes! He is up-to-date on shots, worming, and flea prevention, and is FIV-negative. He is playful, but is also very loving and cuddly. He would make a great pet! This girl is Messina, a black and tan tabby with white chest and feet. She is approximately 2-3 years old and has been at the shelter for a couple of months. Messina has had her shots and flea prevention, has been wormed, and is FIV-negative. She is very curious and sweet, and as you can see from the picture, she loves attention! This boy, who looks a lot like Messina, is Milo. 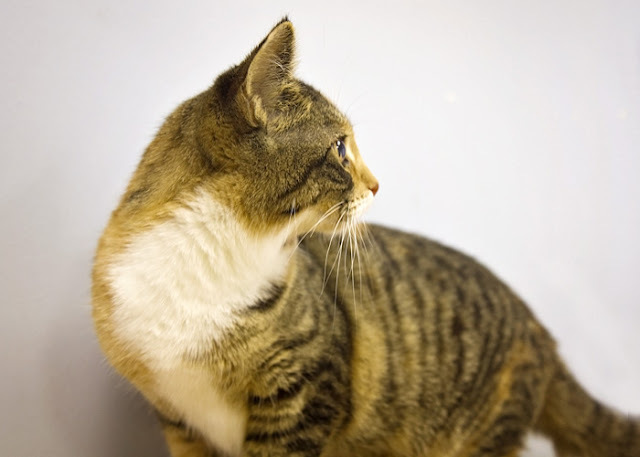 He is also a black and tan tabby with a white chest, white on his paws, and a little white on his face. He is 8-9 months old and has been at the shelter for a couple of months. Milo is up-to-date on shots, flea prevention, and worming, and is FIV-negative. He is a very sweet boy. Just look at those big green eyes! 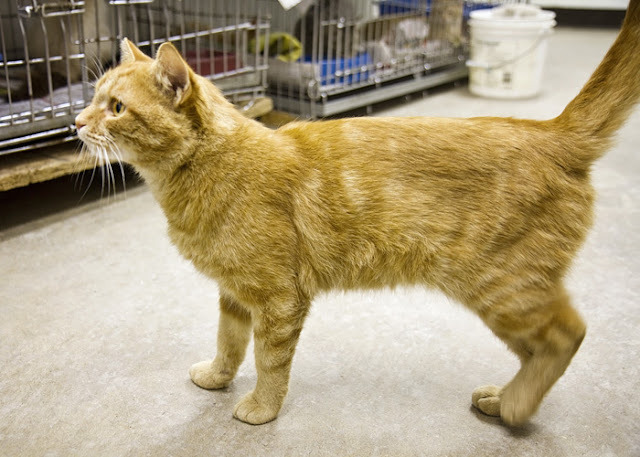 There is another cat at the shelter who is also names Milo, so if you want this boy, ask for him by his number - #643. 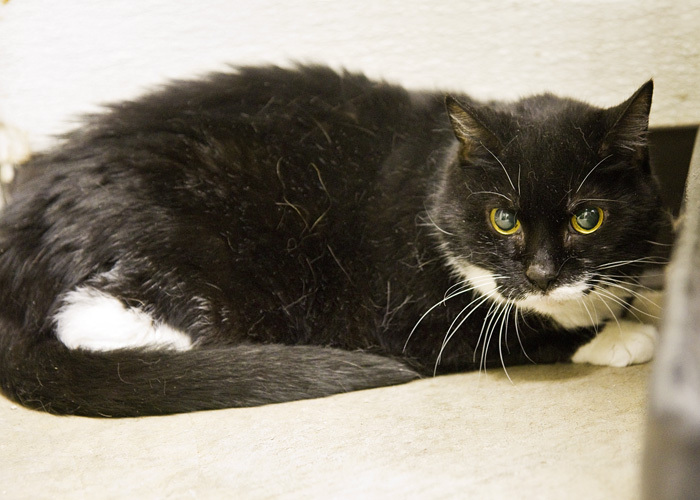 This is Nummies, a black and white female who is 5-8 years old. She is a good-sized cat! In addition to being up-to-date on shots, worming, and flea prevention, she is front-declawed. She has been at the shelter for about a month and a half. Nummies is very shy. 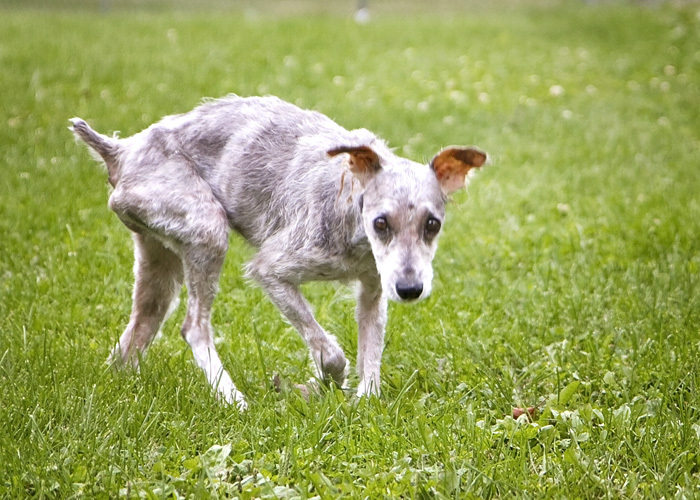 She was an owner surrender when her owner had to enter a nursing home. Even though she is shy, she is very loving, and likes to be held and cuddled. She would make a great companion for an older person or couple! Meet Tony, an orange and tan male tabby. Tony is 1 1/2-2 years old and has been at the shelter for about 3 weeks. Tony is up-to-date on shots, worming, and flea prevention, is FIV-negative, and has been neutered. One of his back legs has a slight limp, which is hardly noticeable. Tony is a very sweet boy! Look at his beautiful gold eyes! This little girl is Trina, a brown, black, orange and tan tabby female. 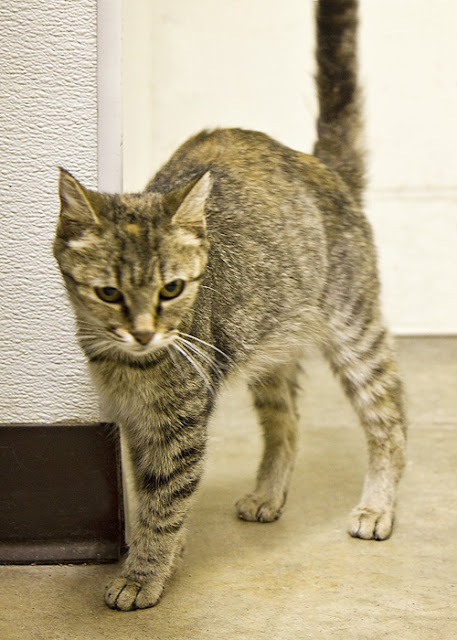 She is approximately 1-3 years old and has been at the shelter since June. Trina has been wormed, has had her shots and flea prevention, and is FIV-negative. She was a little camera shy, but she loves attention! 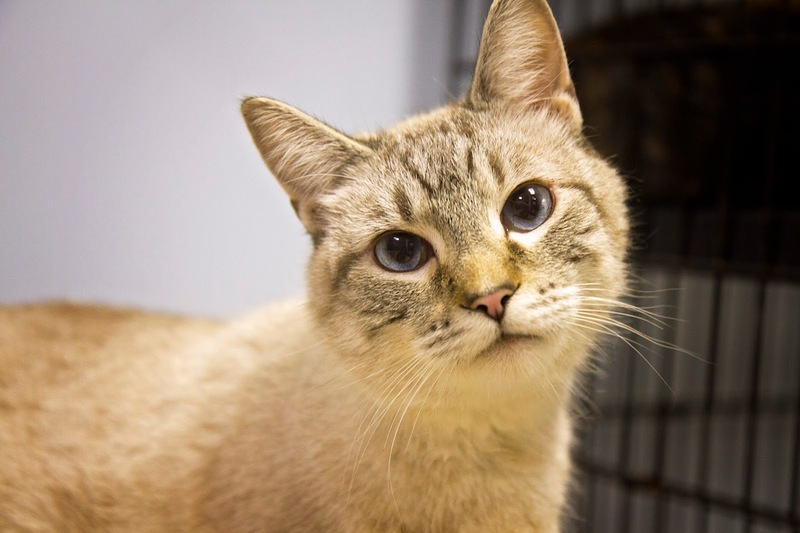 This is Van Gogh, a neutered male Siamese/tabby cross. 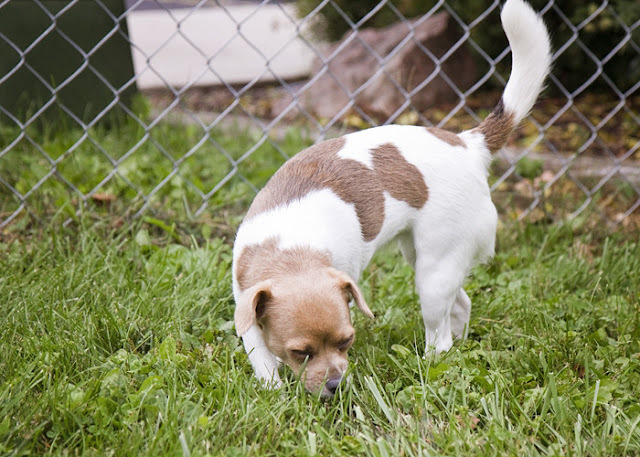 He is cream colored with brown markings, and black on his tail and under his paws. He is 6-8 years old and has been at the shelter for almost a month. Van Gogh has had his shots and flea prevention, has been wormed, and is FIV-negative. 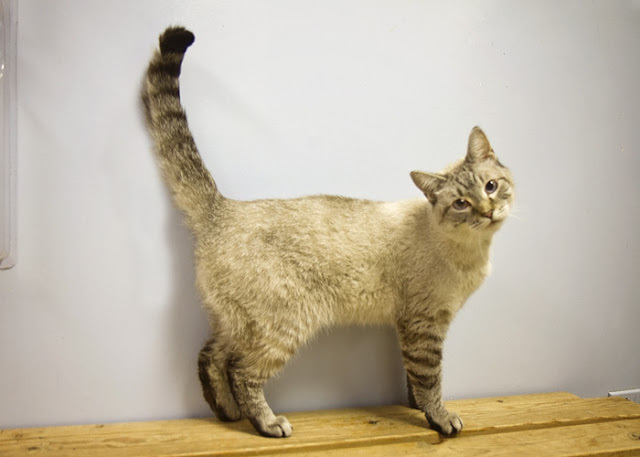 He is a very sweet, loving, and curious boy with beautiful blue eyes! Come visit him at the shelter! All of these wonderful animals, as well as many others, are waiting for you to visit them at the Humane Society of Noble County. Right now the shelter is over-crowded with cats, so for the month of October, any cat or kitten can be adopted for only $15 - twenty dollars off the regular price of $35. Take advantage of this great deal and give some of these animals their forever homes! 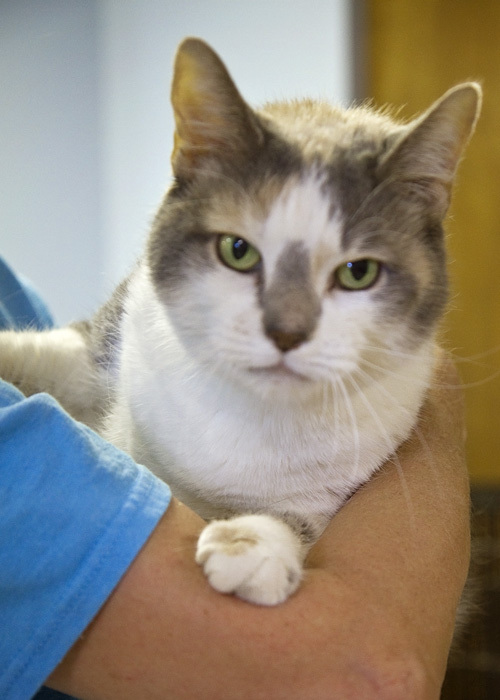 This beautiful girl is Lilly, a dilute calico cat who is around 8 years old. 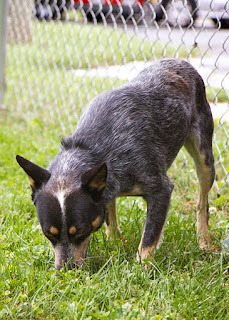 Lilly first came to the Humane Shelter of Noble County near the end of June. She is a big (around 16 pounds) cuddly lover! Two or three weeks ago, she was adopted out to a family that loved her and was going to give her a great home. They posted several pictures of her on the Humane Society Facebook page, showing how well Lilly had adapted to her new home. Unfortunately, Lilly's new owners had a family medical emergency and felt they could no longer care for Lilly like they should, so today she was returned to the shelter. Lilly has been spayed and front declawed, she is up-to-date on shots, worming, and flea prevention, and she is FIV-negative. And for the month of October, because of over-crowding at the shelter, she can be adopted for only $15! 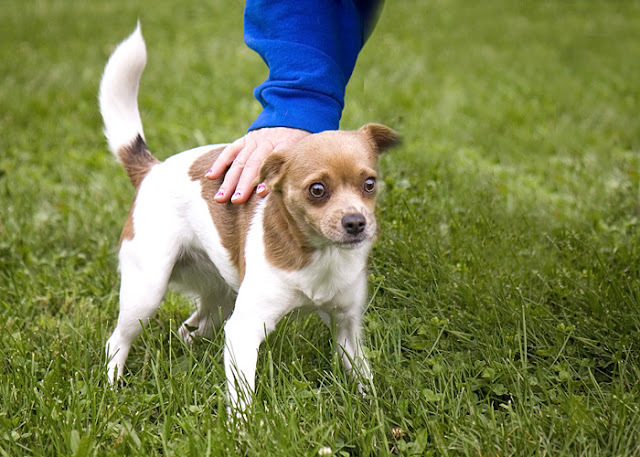 Lilly is very calm and loves to be held and petted! It might be best if she were the only cat in the household. She would be a perfect companion for an older person or couple. 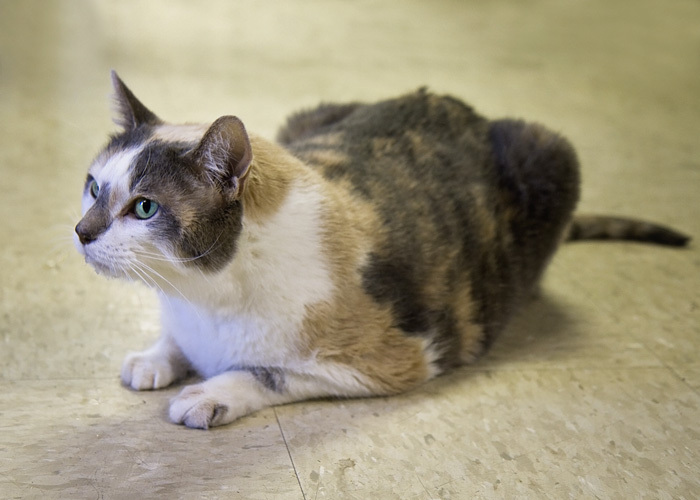 This big girl really deserves to have another chance at her forever home. Please look at these pictures and let them melt your heart! Then come see her at the shelter and make her part of your family! Com to the Humane Society of Noble County to visit Lilly, and see if you could give her another chance to live with a wonderful family! She is such a sweet girl!